In this project, a.k.a Blind Perspective, we wanted to integrate two different perspectives in one same space. The two different perspectives are assigned as the real vision, and the vision seen through virtual reality. The idea is to provide a highly immersive virtual reality experience by physically matching the virtual world space dimensions with those in the real world. The idea became possible by integrating head-mounted displays (HMDs) with accurate indoor-position tracking technology. As the proliferation of stereoscopic 3D virtual reality devices is reshaping the user experience in immersive virtual reality methods, we believed that these low-cost HMD devices are the perfect 3D vision interpreter among other kinds. The system is designed to have six degrees of freedom in the virtual world, which allows users to physically move around in the real world while wearing the wireless system with an HMD. To eliminate the potential safety risk factors such as a user being bumped into an obstacle caused by the mismatched reciprocal positions between the real and the VR or the cybersickness which mainly causes dizziness and nausea due to the sensory gap between the motor and the visual cortex, our main task was to establish a high standard in terms of positioning accuracy and steadiness. We have utilized the ultrasound as the underlying technology for our position tracking algorithm as it enables the finest accuracy and the fast computational speed. 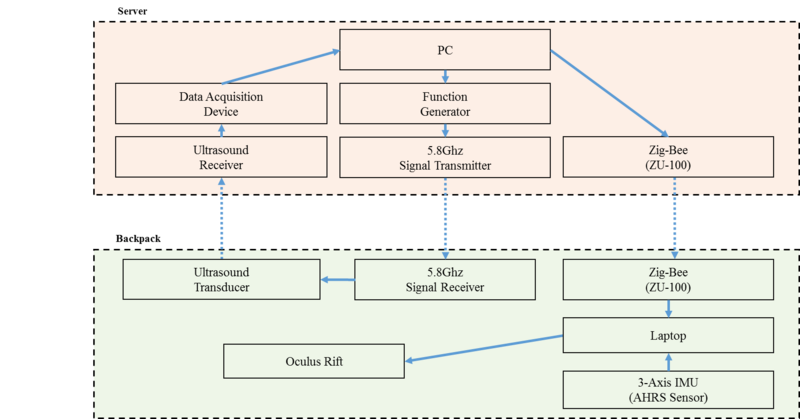 One omni-directional ultrasound transducer mounted on the HMD generates a burst tone at 20 Hz at carrier frequency of 40 kHz. The burst signal is transmitted wirelessly from the signal generator to HMD via 5.8 GHz RF range transmission. The receivers mounted on the ceiling of the room calculate the position by triangulating the signal. A total of 16 signal receivers were used to cover the corridor space of 35 meters in Contemporary Art Gallery in Art Tower Mito. After refining our position tracking algorithm, the test results show that the system has the accuracy of less than 10mm on average. Apart from developing algorithms, we have also implemented dedicated devices which are necessary for the integration of the HMD and the positioning system. Additionally, our system was designed to be wearable, requiring no external power or signal cables. The system is consisted of two main parts, the user position tracking part with the data acquisition equipment, and the HMD integration part with the unity 3d engine. The diagram of all the components is shown in Figure 1. As the purpose of our system is to provide immersive virtual experience with natural interaction/control, we are proud to be a part of the exhibition, yet hope to improve the system by covering a larger space with higher accuracy and immersion. J. Shin, G. An, K. Lee, “Integration of a Precise Indoor Position Tracking Algorithm with an HMD-based Virtual Reality System”, in Proc, ImmersiveMe ’14 ACM international workshop on Immersive media experiences, 2014.